DOT 4 brake fluid formulated with a precise mixture of Borate Esters and Glycol Ethers, plus moisture and corrosion inhibitors. Utilizing quality raw materials yields a superior fluid resistant to absorption and retention of moisture while providing the best protection against extreme temperatures. 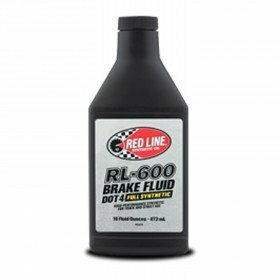 •Blendable with DOT 3, DOT 4 and DOT 5.1 fluids, RL-600 increases ABS cycle times for more responsive and consistent pedal feel. For passenger vehicles, as well as racing car and motorcycles, track day project cars and other motorsport activity.